Born in Bartlesville, OK and raised in Hominy, OK. Graduated from Oklahoma State University in 2004, B.S. in Animal Science Biotechnology. She started as a veterinary technician in Canyon, TX where she worked for 5 years. She recently moved back to Stillwater and is looking forward to working at Perkins Road Pet Clinic. She has a husband who is the manager of Cavender’s Boot City in Stillwater and a 4 year old son. She has 5 horses, 3 dogs, and enjoys spending time with her family and friends. Kyle was born and raised in Pittsburg, KS. He graduated from Pittsburg State University in 2013 with a B.S. in Biology Pre Veterinary Medicine and a minor in Physical Science and Chemistry. 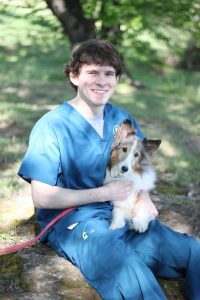 He started as a veterinary assistant at a clinic in Pittsburg in 2008 and worked there for 7 years. 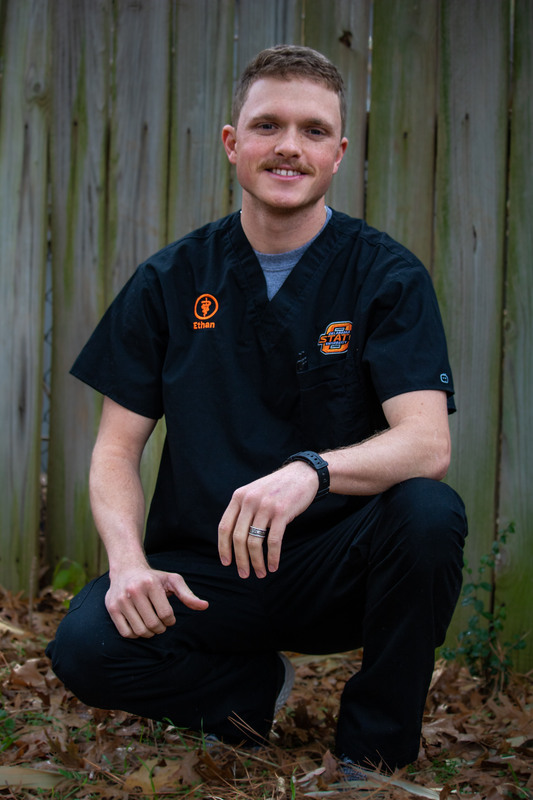 Kyle recently moved to Stillwater in the summer 2015 with aspirations for veterinary school at OSU. He has one cat, one dog, and a leopard gecko. He loves to spend time with his dog Honey and go on long distance runs. Shelby was born in Liberal, Kansas and raised in Mannford, Oklahoma. She moved to Stillwater three years ago and now attends Oklahoma State University, where she is pursuing a Zoology degree with a Pre Veterinary option. She hopes to one day become an exotic animal veterinarian for a zoo. In her spare time she likes to spend time with her boyfriend and two dogs. Born and raised in Oologah, Ok. Ashley graduated from Connors State College in May of 2016, with an Associate’s degree in Agriculture for Pre-vet medicine. She is currently a transfer student at Oklahoma State University working towards a Bachelor’s degree in Zoology for Pre-vet medicine. Working in the veterinary field since she was 16 years old, she has always had a passion for working with animals and has plans on Oklahoma State University for veterinary school. In her spare time she enjoys spending time with her family and friends, going hunting and fishing, and spending time with her beagle Gunner. I was raised and went to school in Mustang, OK. I grew up with four dogs that inspired my love for animals, and that led to my first job at a vet clinic in my hometown. I now reside in Stillwater and am studying at OSU for a bachelor’s in Sports Media. When i graduate I intend to be a producer or content creator for a professional team, but as of now I enjoy working every day with animals and getting to come home to my two pets Iris and Rengar. Sam was born and raised in Oklahoma City, Oklahoma. She now lives in Stillwater and is working towards a Bachelor’s Degree in Animal Science with a Pre-Veterinary option. She has worked in small and large animal veterinary practices since the age of 17 and hopes to attend Oklahoma State University for veterinary school. She has two dogs, a Blue Heeler named Tie and a Cattle Dog/ Collie mix named Moonshine. Tanya is from Wichita Falls, Texas and moved to Stillwater 9 years ago. She began grooming in 2006. She enjoys working with all of the furry patients at the clinic and has been associated with with PRPC since 2010. At home, she has 3 dogs and 4 cats of her own. Ethan was born and raised in Southeastern Oklahoma. Ethan now lives in Stillwater with his wife and daughter. He is pursuing a bachelors degree in Animal Science with an Animal Biotechnology option. Ethan grew up with an agricultural background raising cattle, riding horses, and working at a rodeo arena throughout high school. He has two horses, a retired rope horse named Jack and a paint horse named Scout. Ethan also has two dogs, a small terrier mix named Elle and a black lab named Gage. Addison came to Oklahoma State University from Prosper, Texas to study Animal Science with an emphasis in Pre-Veterinary Medicine. She has been working as a veterinary technician since 2014, and hopes to attend veterinary school upon graduation. In her spare time she enjoys playing music and spending time with her dog Jamie. I am originally from Tennessee and grew up on a farm. However, I adopted every stray animal and had everything from a squirrel, goats, chinchillas, and chickens along the way. I have always had a passion and love for animals. I started at 14 shadowing veterinarians and have followed that love to Oklahoma where I now call home. I am finishing my Bachelor’s degree and praying I continue my education in vet school here at OSU. In my spare time when I am not working or in school, I compete in Cowboy Mounted Shooting which has been a huge part of my life. I pride myself in taking great care of your pets while they are here and look forward to continuing to become a great vet some day.